Sony still make Walkmans – and a flagship device is coming out next month! No, don’t worry – you haven’t been transported back to the 1980s. I know it sometimes feels like it, but I assure you all of those famous presenters are on TV now for very different reasons. But yes – Sony have announced a new Walkman. Read on for details. Then new device, the NWZ-ZX1 doesn’t take cassettes and won’t make you the coolest kid on the playground (besides, shouldn’t you be at work? ), but it is a neat looking device. 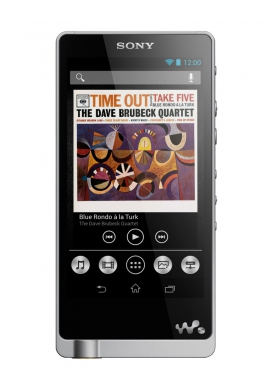 More akin to a smartphone than the tape players of yore, it runs Android and is being positioned as an elite device focused on high quality music. Apparently it majors in playing back the highest possible fidelity recordings – it supports playback of 24bit/44.1kHz encoded files, which is the same quality the tracks are recorded at – and even better than CD quality. Crucially it supports a wide range of codecs: FLAC, WAV, Apple Lossless, PCM, AIFF – so should be able to play anything you throw at it. It also supports MP4 video and JPEG images for playing back video and photos. Also on board is a 128GB hard disk, which Sony reckon can hold 800 of these super high quality songs and they also promise a “digital upscaler” that will improve the quality of regular lower quality MP3s (consider us skeptical on this latter feature). Behind the scenes it runs Android 4.1 – better known as Jellybean, so it will also work with the myriad of Android apps over wifi – but of course, it isn’t a phone so there’s no 3G or 4G here. The interface looks very similar to Sony’s smartphone range too, so if you’ve used an Xperia this will all be familiar to you. What is nice though is that along the side of the device there are hardware buttons to control playback – like your old Walkman – so you can play, pause and skip tracks without faffing about with the unlock screen. Another bonus is the inclusion of NFC, that can speed up the pairing of the device to bluetooth speakers, because all you will have to do is tap. Apparently it’ll be available in the UK from February for £549. Excuse me? 24 bits and cd sample rate? What would be the point of that?